The 5.11 Tactical Ignitor Backpack is a lightweight, structurally enhanced backpack engineered for the long haul and tough work. Adjustable, removable load-bearing belt panels are compatible with the ThumbDrive Holster and SlickStick System, and the Zephyr suspension system features padded aerospace mesh for comfortable carry of heavy loads. The 5.11 Tactical Ignitor Backpack is a lightweight, structurally enhanced backpack engineered for the long haul and tough work. Adjustable, removable load-bearing belt panels are compatible with the ThumbDrive Holster and SlickStick System, and the Zephyr suspension system features padded aerospace mesh for comfortable carry of heavy loads. The bag also offers built-in RUSH Tier scabbard capability, for superior rifle carry. 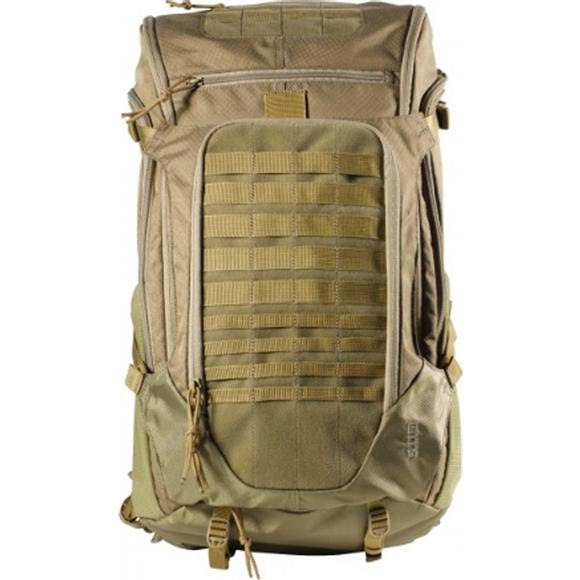 The durable 840D nylon bottom and rugged 300D ripstop polyester body ensure lasting performance, while the stuff-it pocket, zippered side pockets, top-loading main compartment, and the MOLLE-compatible exterior provide ample storage. Lashing, load-suspension, and compression straps keep things secure, and a standard-sized hydration compartment keeps you ready.